With the amount of earthquakes hitting Japan, you can trust that the Japanese would do more than creating buildings that can withstand the moving plates. 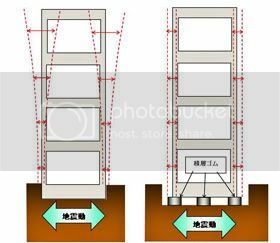 More and more buildings are now not just earthquake resistant but “earthquake deaf” with the implementation of seismic isolation systems or 免震装置 (menshinsochi). The image on the left shows the regular buildings here. When an earthquake happens, the building shakes together with the ground, causing all your items at home to crash (if it’s bad enough). The image on the right shows how the seismic isolation system works. Buildings do not come into direct contact with the ground. The 3 cylindrical items below the building are what keeps the building from shaking (too much). They’re made of rubber so when the earth moves, the cylindrical rubbers bend and while the bottom part moves with the ground, the top part remains, keeping the building in the same position regardless of how the ground moves. To get a clearer picture (literally), see below.